On 16th May 1975, Fife Fire Brigade kept the same name and covered the same area but was now administered by Fife Regional Council. 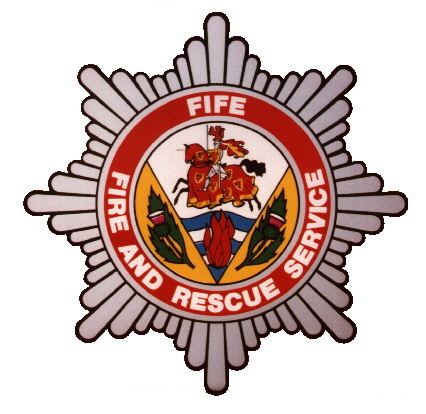 In 1985 the brigade changed its name to Fife Fire and Rescue Service to better describe the modern function of the service. On the 1st April 1996, following Local Government Reorganisation administration of the brigade was transferred to Fife Council Protective Services Committee but the area covered remained the same. The Committee has 26 members. Firemaster Partington became Chief Fire Officer of Hereford and Worcester Fire Brigade from 1/4/1977 to 9/12/1987. At some point he was awarded an O.B.E. On a lighter note, Mr O'Donnell is related to his famous showbiz namesake: "He's my cousin and we meet regularly. The only real difference is I can't sing and Danny can't put out fires." In 2002 Fife Fire and Rescue Service cost Council tax payers 92 pence per person per week. 1/6/2011 All Fife's specials, with the exception of the CARP at Dumfermline, are now Jump Manned/Dual Crewed. If the ICU at Dumfermline is required two off the CARP crew it and the CARP is crewed by two as an aerial only. The CARP has a crew of four. 13/4/2010 The new fire station at Pitreavie replacing the stations at Dunfermline and Rosyth is to be officially opened today. 13/6/2009 In the Queen's Birthday Honours List Brian Ritchie Hughes, Retained Watch Manager, Tayport Fire Station was awarded the Queen's Fire Service Medal.